Bought new and have had for 7 years, 81K miles. 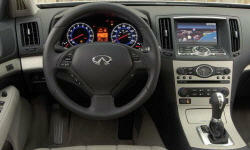 Why the 2007 Infiniti G? Seven years old and still looks great. Bought a clear bra with it was new. Really helps on all the highway driving, only one chip on the nose from a small bolder that fell from a dump truck. Interior is very clean with the wood molding option - still looks great. Only disappointment: I did have the steering wheel issue with the molding paint rubbing off at the thumb grip. Dealer wouldn't replace the wheel unless I bought a new one for $1600. My average for the life of the car is 21MPG. Not too bad for a car with this power and my lead foot. 81,000 miles and no real problems to report, just basic maintenance; oil changes, tires. The dealership did do a couple of minor recall items early on. Still on my second set of tires and second set of break pads. After 81K miles it's probably not producing the 308HP it did at the beginning, but I always liked the power band. Do wish it had a higher top gear to improve the gas millage on the highway. 3200RPM at 75 always seemed to high. They did improve that on subsequent G37 models. The G37 seems to have better power at 35-60 range, but mine seems quicker off the line. 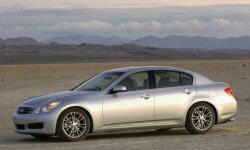 Why Not the 2007 Infiniti G? The original stock Goodyears were not that good. the Kumhos I replace them with have a better ride and are quieter. Great styling and power. I owned a 2004 G35 before this one and the 2007 was an upgrade in every way.